Four days from now, my BF and I will be heading up to Michigan's upper peninsula for a week of camping in Porcupine Wilderness State Park. It's absolutely beautiful up there... and peaceful. A welcome change of pace from urban life. Last year, we spent a week inside Great Smoky Mountains National Park, camping and hiking. 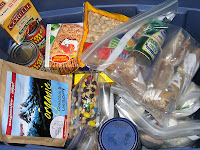 My food survival guide for that trip was Lipsmackin' Vegetarian Backpackin' which introduced me to freezer bag meals. Essentially, freezer bag meals are a mixture of dry ingredients, stored in a zip-close freezer bag, to which hot water is added to cook/rehydrate the dry ingredients. I grew up camping, but doing what you'd call "car camping" which means you can eat pretty good because you don't stray too far away from the cooler and cookware in your car! My BF is very outdoorsy though and wanted to give the freezer bag meals a try. I was game, especially since I scored the LVB book. Our first time using the book, I wasn't sure how tasty the meals would be. The ones we tried on our trip last year turned out to be pretty good. I mean, my BF ate veg the entire week without complaining... I think that says something! This year, to mix things up, I purchased the Freezer Bag Cooking book. While not entirely veggie, there are vegetarian recipes in the book and a lot of the dishes could be modified to be vegetarian. Most of our recipes this time out will be from this book. There are quite a few couscous recipes: spinach couscous, tomato couscous, cinnamon and sugar couscous (for breakfast!). Fingers crossed they are good! I am soooooooooo looking forward to this vacation. I love, love, love being out in nature. And, I really love what my home state has to offer in terms of vacation destinations. Before we reach the Porkies, we plan to camp two nights in St. Ignace in an effort to break up the drive (the Porkies are a 12-hour drive from my area). While in St. Ignace, we hope to skip over to Mackinac Island for a day hike there. I'm really excited about that because, while I've been to Mackinac Island many times, I've never hiked the trails there. Plus, it will be nice to visit the charming island again. I've been to Nantucket and Martha's Vineyard... and I'll take Mackinac Island any day over those two famous isles! This will likely be my last decent post before the trip. But, I do plan to post a summary of our trip when I return... that won't be till Sept. 9 at the earliest, though. Please don't forget about me! I know I'll be ready to resume making and posting yummy home-cooked meals after 9 days of freezer bag cooking, LOL. Till then, take care everyone!